The end of poverty, requires the end of violence = Peace. The Locust Effect. The links are sometimes blended together so that poverty as a contributor to crime, is confused with poverty and war. Poverty and crime taken together have been most studied in Western civilized and urban settings. and a second from the Institute of Developmental Studies which explores the elements of War-Poverty-War cycles. Clearly, infusing Peace into Targets involved in such cycles, may provide the only hope for interrupting this apparent close relationship of Violence and arising in, and followed by poverty. "The world has been getting less equal for decades, but last year, rising inequality became an especially fashionable topic of discussion, in no small part because of the release of the economist Thomas Piketty’s book “Capital in the Twenty-First Century” (which John Cassidy reviewed in the magazine), a discussion of the divergence between the world’s rich and poor. This year has brought renewed focus on another measure of global economic well-being—one that looks better, thankfully, than the inequality figures. 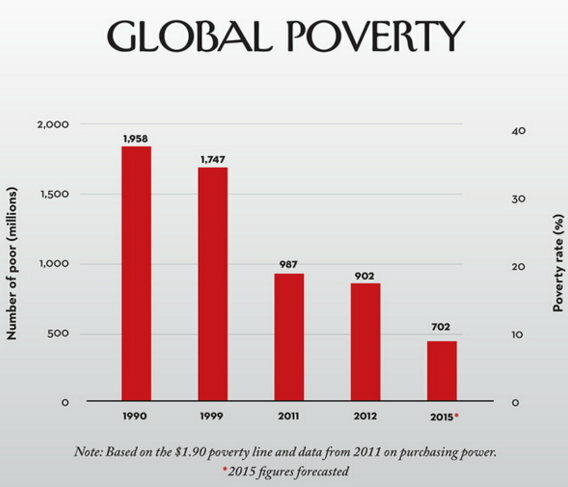 Even as inequality has grown, extreme poverty appears to be at its lowest level ever. This might seem counterintuitive, but it has happened because, although the wealth of rich people has grown more than that of poor people, the wealth of both groups, on average, has grown. In October, the World Bank projected that fewer than ten per cent of the world’s population was living below the extreme-poverty line of $1.90 a day—down from thirteen per cent in 2012 and twenty-nine per cent as recently as 1999. Much of the decline has to do with rising prosperity in China and India, as those countries’ economies have benefitted from greatly expanded investment by foreign companies and countries, as well as by their own governments." 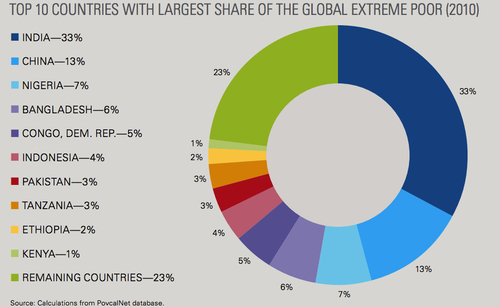 80 % of the world's poorest populations, live in just 10 countries.